The Famous 1938 Carnegie Hall Jazz Concert by Benny Goodman, Columbia Records catalogue item SL-160, was first issued in 1950. 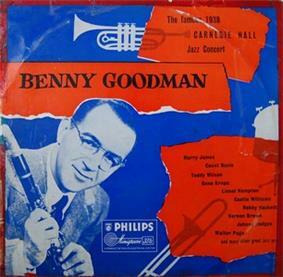 It was one of the first records of Benny Goodman music issued on the new long-playing format, and one of the first to sell over a million copies. A landmark recording, it was the premiere performance given by a jazz orchestra in the famed Carnegie Hall in New York City. It is the first ever double album. This album was also sold in a set of nine 45 rpm records in the same year by Columbia. Bruce Eder, writing for allmusic, generally praises the 1999 double-CD release, noting the compromise between clear reproduction of sonic detail and retaining surface noise from the source material. The Penguin Guide to Jazz Recordings includes the 1999 release in its "Core Collection," in addition to giving it a four-star rating (of a possible four). Penguin authors Richard Cook and Brian Morton describe the release as "a model effort, masterminded by Phil Schaap, whose indomitable detective work finally tracked down the original acetates and gave us the music in the best sound we'll ever get; with powerful, even thrilling, ambience." Tracks 20-28 are edited tracks from a 12" 78 rpm record, recorded in 1950 and sent to radio stations to help promote the album release. ^ a b Eder, Bruce. The Famous 1938 Carnegie Hall Jazz Concert at AllMusic. Retrieved 2012-06-15. ^ Liner notes from 1999 reissue. ^ Sohmer, Jack (1938-01-16). "Jazz Reviews: Benny Goodman at Carnegie Hall-1938: CompleteBenny Goodman — By Jack Sohmer — Jazz Articles". Jazztimes.com. Retrieved 2012-01-06.